Specializing in Commercial Fleet Servicing, 2Utire & Wheel come to you to keep your vehicles going. 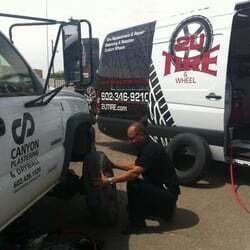 2UTire & Wheel sells and installs new tires ON SITE while your employees keep working. We eliminate the down time associated with tire replacement and basic auto repairs on your company vehicles. We have competitive prices on all tires and tire repair. We do anything from a passenger vehicle to medium duty trucks. We also do mower, trailer and skid loader tires. We come to you, saving you both time and money!